What are expectations? Can these expectations ever end? I think, no... It's the human tendency to expect more till everything he desires comes his way. "Sorry! I loved you", the story of a sweet girl Priya and an innocent boy Siddharth ends with the base line 'MADE FOR EACH OTHER'. Though Priya and Siddharth, were not with each other but in real they were meant for each other, what separated them was their expectations from the other. They had an indefinable love for other but they allowed expectations to follow which ultimately made them to "COMPROMISE". 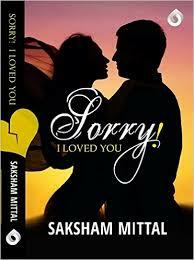 Sorry I loved you marks the debut of Saksham Mittal in the writing industry. It is a love story at its core which is published by PETALS and is edited by Harpreet Makkar. So let me begin with its real review. So priya and siddharth meet at the latter’s house during a wedding where Priya happens to be the choreographer of the event. Siddharth falls in love with her at the very first sight (WOW!). He only later discovers that she is far elder than her.(AMAZING!). After a serious (read: predictable) turn of events and after some years Siddharth finally confesses his feelings. At this point the story gets a bit too romantic and I appreciate Saksham for that. After this the book gets a lot too predictable and simple. When Priya finally accepts his feelings the two start going out and you can expect them to do all the things that childhood sweathearts do. In short the story loses its grip and you really wonder whether to carry on or not. After another 100 pages which are a lot too tiring the story reaches its end which is way more exaggerated and unreal. Apart from hundreds of editing blunders, loose story, imperfect situations, and an even more uneven grip , the only thing that makes up for the faults is the appreciable starting and cute notes that are scattered in the book. Given the storyline the story could have been much, much better. As far as writing is concerned the author needs to put in some more emotions and seriously needs to make sure that the story does not turn predictable. The book could have been much better with better writing and editing. To comment on editing, well it seems like the manuscript was given to a ten year old. The editor really needs to work hard, not for the upcoming editions of this book but also for his future. A note to the publisher- well you could have generously invested more on the printing. Half of the disinterest in the book arises due to its bad quality printing and the bad texture of the pages. Would like to say stop printing such mess, its look like an absolute waste of time and money, neither is the title interesting nor the story. With much leniency I would like to give 1.5 stars.